Eurocom Corporation (www.eurocom.com), a leading mobile technology developer is launching new GPU’s for the Modular Embedded and CUDA Developer Markets based on the industry standard MXM 3.0b specification. NVIDIA GeForce GTX 580M and NVIDIA Quadro 5010M are new cards offered by Eurocom to those looking for high performance graphics processors. The solutions are aimed at embedded systems, SFF (Small Form Factor) PC and CUDA developers that require high performance GPUs. The industry standard modular MXM 3.0b specification for graphics subsystems allows for improved cooling capability, reduced power and height, enabling engineers to create smaller, more efficient embedded systems, reduce development time and costs and to introduce new designs faster to market. Modular graphics solutions offer additional functionality as well as increased levels of performance compared to integrated graphics for developers of all kinds. The newest offering from NVIDIA, GeForce GTX 580M supports NVIDIA PhysX® technology, NVIDIA CUDA® architecture, for GPU computing applications and are also supported by the highly-praised NVIDIA Verde™ notebook drivers. NVIDIA GeForce GTX 580M GPUs offer even more performance-per-watt than the previous generation, with faster frame rates and more detail with power consumption. The NVIDIA Quadro 5010M supports Open GL 4.1, DirectX 11, Shader Model 5.0, and Error Code Correcting RAM, and is based on the NVIDIA CUDA™ architecture. 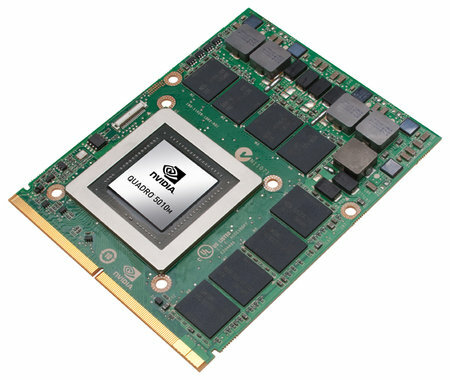 The 384 CUDA cores in the Quadro 5010M can be accessed using DirectX 11 and OpenGL 4.1 for graphics rendering, and utilize Direct Compute, OpenCL, NVIDIA application acceleration engines and CUDA for general purpose calculations. The Quadro 5010M also features an unprecedented 4 GB of GDDR5 memory to enable interactivity on the largest projects. Error Code Correcting RAM is supported to detect and correct errors in data, meaning failing bits in a memory word are detected and corrected on the fly with no impact to the application. Built on the innovative NVIDIA Fermi architecture, the latest Quadro mobile graphics solutions integrate high performance computing capabilities with advanced visualization. Eurocom is a leading developer of long lifespan, fully upgradable notebooks, high performance mobile workstations, VGA solutions and mobile servers since 1989. The company has produced many firsts and continues to engineer VGA solutions that inspire and enable individuals and companies to reach great possibilities. Eurocom has been a leading innovator in the mobile computer industry since 1989, is currently the only developer in the world offering a Server on the Go solution along with a full line of Mobile Workstation supporting RAID 01/5/10 with up to 4 hard drives. For more information on Eurocom please visit (www.eurocom.com).